A candy shop is complete when it has a full selection of Jelly Belly jelly beans and Jelly Belly Confections. If you are the owner/operator of your own shop, you’ll want to download our various catalogs to get an up-close view of all the items we offer. If you wish to carry our products feel free to call and we will be happy to answer any questions that you may have! Please call 1-800-323-9380 (US only) or 707-428-2800 (all countries) and ask for Customer Service. Please note: Catalog pages are large Adobe® Acrobat® (PDF) files. They may open very slowly. To open them more quickly, please RIGHT-CLICK on the link and select "Save Target As..." from the list to save a copy to your computer. Residents of Massachusetts, Mississippi, West Virginia and Wyoming must use Multi-Jurisdiction Resale form 2. 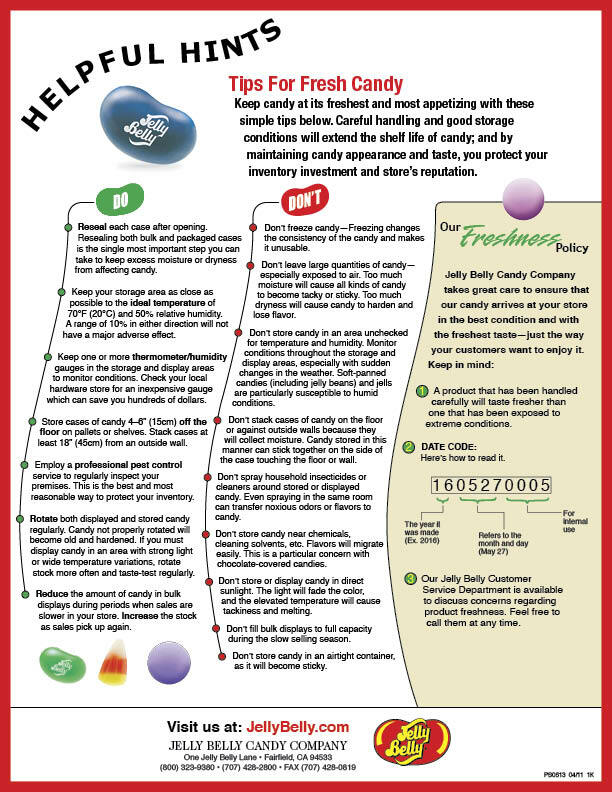 To submit your forms, fax 707-399-2914 or email us at NewAccounts@jellybelly.com. (Note: this information is only to be used for submission of forms and certificates.